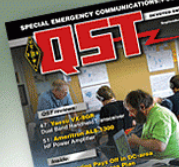 The September 2011 issue of the ARRL QST magazine features an article by two NIHRAC members, W3CID and WA3LTJ. The article, titled "Optimizing Amateur Radio Resources for Major Disasters", describes the development of the first version of an emergency digital radio system based on the Winlink 2000 system. An enhanced and expanded version of the system is being currently developed. The work is funded by the National Library of Medicine (NLM) for the Bethesda Hospitals' Emergency Preparedness Partnership (BHEPP), and developed through a contract with Aquilent, inc. with contributions from NLM, NIHRAC, Army-MARS, and other hams.